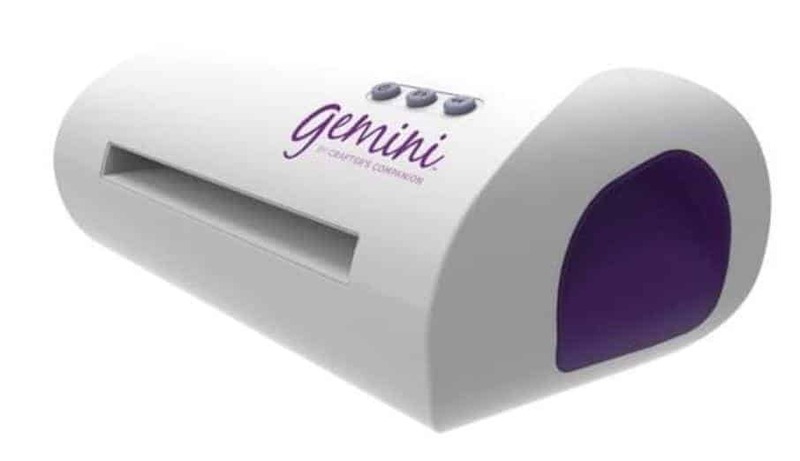 The Gemini Cutting Machine is one of the select few electric die cutting and embossing machines on the market. Most electronic die cutting machines don’t have the functionality to emboss, so it is exciting when you find a machine that can do both. The machine still has its limitations though, as it still relies on dies and folders (unlike more expensive electronic die cutting machines that can cut any shape). It has a large platform size of 9″x12.5″, which is pretty impressive for a machine that uses dies and folders. Wondering whether the Gemini Machine Crafters Companion is for you? Hopefully, our Gemini Die Cutting Machine Review will help answer that question for you. 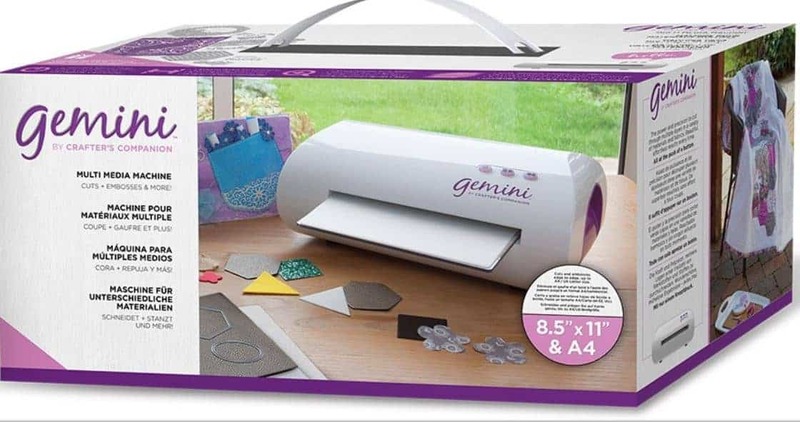 Find below our review rating of this great electronic Crafters Companion die cutting machine. 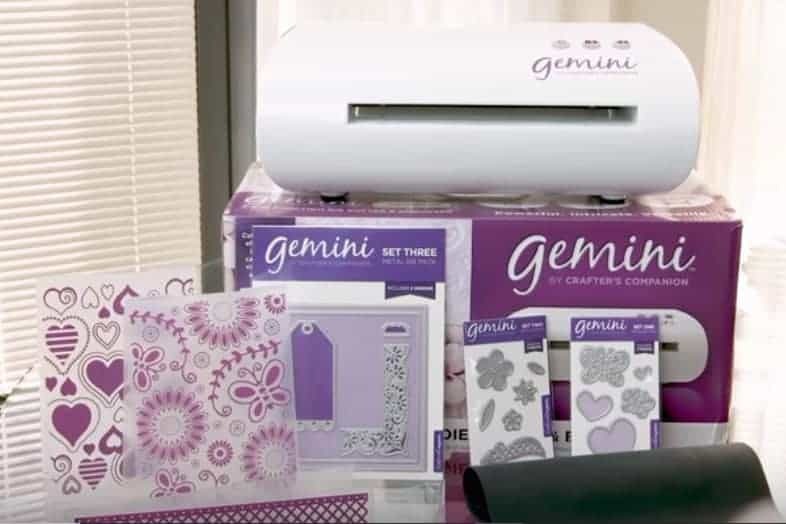 The Gemini by Crafters Companion is a great electronic die cutting machine for paper crafters. This electronic die cutting and embossing machine is a great purchase for those who wish to upgrade from the manual cutters. The machine still work with dies and folders, but has the ease of operating with the push of a button. The machine is quiet and works fast. It does have a slightly expensive price-tag, but there aren’t many machines that can work electronically with dies and folders. Quiet and works fast. Comes with a large set of dies and some folders as well. Can work with other brand dies and folders. I can handle intricate dies with ease. Has a useful pause and rewind function. It is electronic. It has a large platform size of 9” by 12.5”. Gemini dies warp easily. Slightly more expensive than we think it should be. Slightly on the heavy side. The Gemini Machine fabulous machine if you are after an electronic die cutter, but you can’t quite reach the price-tag of the more professional electronic machines. If you do want to compare this machine against other machines, you might like to visit our detailed guide to the best craft cutting machine. Find below a quick look at the main features of the Gemini machine. So What Comes in the Box? The Die Cutting Machine comes with all the platforms and plates that you need to get started. What we love about the Gemini is that it also comes with a nice selection of starter dies and folders (so no need to fork out extra money on dies just yet). What are the Cutting Dimensions? The cutter has a lovely and large platform size of 9” by 12.5”, which is much larger in comparison to the platform size of Cuttlebugs and the Big Shots. This size allows edge-to-edge cutting of A4 and US letter size materials. The size will also allow you to cut more than one die at a time, which ends up saving you time – always a good thing! What Brand Dies and Folders Can you Use? It can also use all of their embossing folders as well, including the popular Craftwell 8.5 × 11 Embossing folder. Slightly more expensive than we think it should be. The machine is actually very popular and we have only heard good things from those that have purchased it. If you love working with dies and embossing folders and you can reach the price tag, then you will surely be happy with this sleek and modern little cutter! It is quiet, but powerful and creates beautiful die cuts. You can read through all the positive reviews on Amazon here, or simply click the button below to grab your cutter now.